Arizona State University hosts Arizona Student Energy Conference with University of Arizona and Northern Arizona University. ASU PhD student and Energy Club Leader Jason O'Leary speaks with a colleague at the Arizona Student Energy Conference. 'This is a real world experience that could help students take their projects to the next level and make a real global impact,' said Stephen Goodnick, ASU LightWorks deputy director. 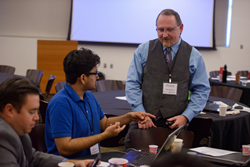 University students from across Arizona set aside in-state rivalries April 1-2 to plan for a better global future at the Arizona Student Energy Conference (AzSEC) at Arizona State University. At the conference, 95 students from Arizona State University, University of Arizona and Northern Arizona University presented their work on new photovoltaic technologies, the power grid system and new programs dealing with energy policy and its implementation. Participants also interacted with guest speakers, including Mahesh Morjaria, vice president of global grid integration at First Solar, as well as staff and faculty. This year marked the first time NAU participated since the conference’s conception in 2011. Ana Dyreson, a mechanical engineering master’s candidate at the NAU Institute for Sustainable Energy Solutions, said the conference gave her the opportunity to network with peers from other backgrounds and institutions. Participating students were able to vie for cash awards during the poster presentation portion of the conference. Poster presentation winners this year included Marely Tejeda, Yongjie Zou and Ian Pahk from ASU, David Racke, Mike Liao, and Juan Russo from U of A and Devon Martindale and Kelsey Morales from NAU. This annual conference is made possible by ASU LightWorks, an ASU initiative that unites resources and researchers across ASU to confront global energy challenges. The conference is also supported by UA Renewable Energy Network and the Institute for Sustainable Energy Solutions at NAU. Tucson Electric Power Company and Research Corporation for Science Advancement were also sponsors of the event. For more information about the Arizona Student Energy Conference, visit energy.arizona.edu/AZSEC‎.